Bridge irrigation systems – indoor | TUBUS Rýmařov, s.r.o. 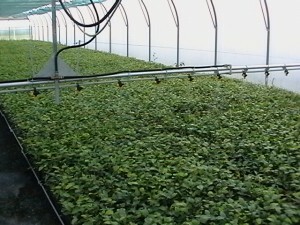 Leading producer of the supplements for seedlings protection in Czech Republic. The bridge irrigation system for covered silvicultural area is a special product, which serves for the most quality application of irrigation water to grown plantations in greenhouses, plastic greenhouses, under screens etc. 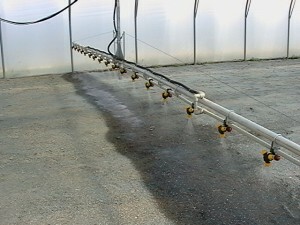 spraying of plantation for example with fungicides. The irrigation bridge is driven by a small engine with safe voltage and the whole system is hung up in a special profile, in which it performs linear motion in the heigsht of hundred to one hundred and sixty centimetres above ground. The bridge is height-adjustable, according to the height of grown plantation. The irrigation bridge is equipped with special 3-ply nozzles (possibly 4-ply), on customer’s request. Three nozzles are placed in the 3-ply, each carries out another function (irrigation, fogging, spraying). 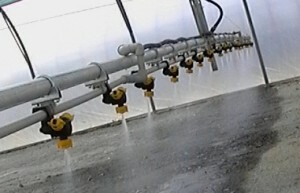 Each nozzle is equipped with anti-dribble valve, which prevents water dribbling when water pressure drops. It can be controlled manually, in semi-automatic or automatic regime. When controlled manually, it can be made from control desk, where irrigation time can be set in the range of 1-16 travels of the bridge. The irrigation switches itself off automatically after execution of selected time interval. 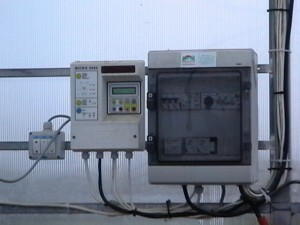 In semi-automatic regime (on customer’s request), the control of irrigation can be connected through computer and can be controlled centrally. 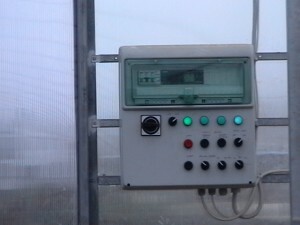 In automatic regime, the irrigation can be programmed on the basis of scanning the temperature and humidity by sensor located in the plastic greenhouse. 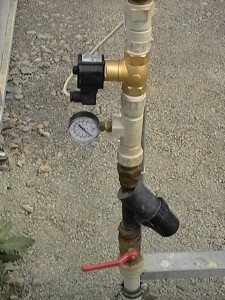 During irrigation, it is possible to apply fertilizers, which are dosed by dosing device Dosatron. It can be controlled manually, in semi-automatic or automatic regime. 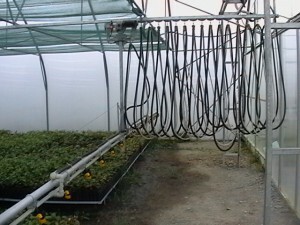 The system is similar as for irrigation. 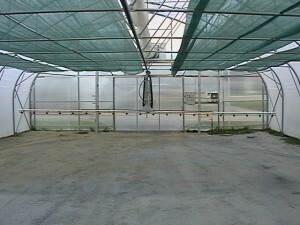 The fogging function serves for cooling the microclimate in the plastic greenhouse in summer season, when it is difficult to ventilate the plastic greenhouse. It is controlled manually. When using spraying function, it is possible to double the travel speed of irrigation bridge and so to achieve a lower consumption of fungicides for one application. The fungicide is suctioned by dosing device Dosatron from a vessel in precise concentration ratio. We manufacture the bridge irrigation systems in different widths (on customer’s request) and according to the width of plastic greenhouse or greenhouse. All metal parts are coated with zinc. Advantage of the bridge irrigation systems lies in absolutely accurately applied dose of irrigation water for unit of area, under balanced pressure and from minimal height over grown stand. The situation is similar for spraying, where thanks to minimal height of the bridge over the stand and balanced pressure, the application of for example fungicide is ensured to its whole height. plants in containers and planting plates.